Exotic plants and animals in lakes are bad. We know about milfoil and the headaches it causes, but there are other aquatic invasive species that are as bad – even worse. We certainly don’t want them in Lake Minnetonka, or if they get here, we would like to know how to manage them. There are five legs to the invasive species management stool. They are education, regulation & enforcement, prevention, early detection & rapid response and control. By looking at invasive plants and animals – either those already in the lake or those we hope to keep out – we can focus on the areas demanding most attention and action. Education refers to raising the level of awareness among those who are likely to move invasive species. This awareness should then result in changes in behavior that reduce the risk of infestation. This leg is already strong. State and local agencies have done a good job in raising awareness and should continue to do that. This can become a problem when this leg is all that is relied upon, which to a certain degree is the current situation. Regulations and enforcement are inadequate. There are regulations prohibiting moving aquatic vegetation attached to boats and trailers on public roads and into lakes. Unfortunately, these regulations are poorly enforced. If done well, enforcement should not be punitive; rather it should reinforce changes in behavior, as with speeding tickets. Prevention means intercepting known vectors, most often boats and trailers, before they have a chance to infest a lake. In most cases, prevention requires inspections and monitoring. This is critical because even though the level of awareness and voluntary action is high, the mantra – “it only takes one” – is true. Thus, this becomes a numbers game. Resources must be devoted to preventing a low probability event, much like the inspections we now expect at airports. Early detection and rapid response requires advanced, systematic monitoring (detection) and a plan (with funding) to act quickly if an invader is discovered. For some species in Lake Minnetonka, this step is too late. Eurasian watermilfoil, curlyleaf pondweed and largemouth bass virus are already in the lake. For other species, like hydrilla, early detection is critical. Hydrilla is particularly scary because it is more aggressive than milfoil. There are no early detection plans in place for hydrilla. For other species, like zebra and quagga mussels, spiny waterflea and viral hemorrhagic septicemia (and many others), early detection is moot because there are no know ways to eliminate or control these invasive species. Finally, control refers to managing the invasive species to mitigate its nuisance and minimize its ecological damage. For Eurasian watermilfoil and curlyleaf pondweed, controls have been in place for some time. The harvesting program plus cutting, pulling or herbicide treatments done by individual lakeshore owners have been the only options. 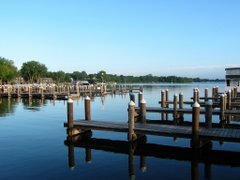 Following the 2006 demonstration project, the Lake Minnetonka Association and the LMCD are engaged in preparing a lake vegetation management plan to provide wider control of these pesky weeds. We hope to be able to implement that plan this coming season in three bays – Carman’s Gray’s and Phelp’s. Except for hydrilla and several other invasive plants, which will likely be more difficult to control than milfoil, most other invasive species coming our way cannot be effectively controlled. Therefore to protect our lake, we should put all of our eggs in the prevention basket as well are relying on state and other agencies to continue their education programs and beef up the enforcement programs.